Hey everyone! Just wanted to share some quick reviews of a few products I've used up completely lately. I personally love empties because you really get a chance to see how good a product is and if it's worth repurchasing which is always great for being a better shopper the next time around. Let's check out the video below! 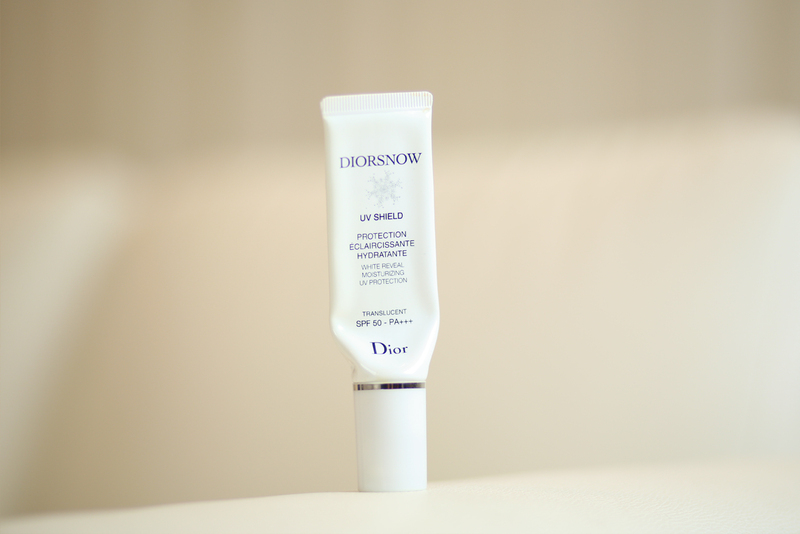 A product from this particular batch of the empties that I wanted to highlight is this Diorsnow UV Shield SPF 50 PA+++ Sunscreen. This was a pretty pricey splurge for me but I took the plunge because of the high SPF protection as well as hearing wonderful things about it from other bloggers. I enjoyed using it while it lasted but it does have quite a strong floral fragrance so that's something to note if you have a sensitive nose like me. The nice thing about it is that it doesn't feel too greasy after application, since I know all too well how a bad sunscreen can turn you into a greaseball all day. It's not a matte finish like Shiseido's sunscreens but it doesn't give me that lasting greasy shine. The kicker for me isn't that there was anything bad with it, it's just that at $58 I've tried other products that seem to work just as well as this did. Because of this, I've decided that I'm still on the hunt for a less-fragranced sunscreen at a lower pricepoint. 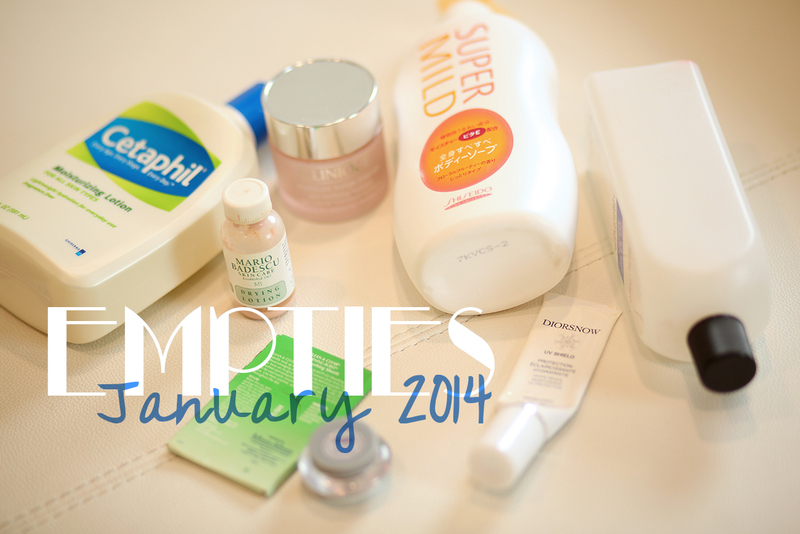 Readers, what is your favorite "empty" for this month? Do you have a top sunscreen recommendation? Let me know in the comments! I always use Cetaphil cleanser for the oily skin over and over. I love that but never happen to try the moisturizer one. i have to check it out since u mentioned it :) and my empty for this month is make up for ever mist and fix :( that stuff is so good and keep me matte longer! Try Cotz All Natural Sunscreen SPF 40. It is slightly tinted and has a matte finish. It's $20. I got my friends to buy it and they all love it! Let me know if you find a decent sub for the CD sunscreen because I'm in the same predicament...$58 is too much on an ongoing basis. I love the gel liner from the new Fergie Wet n' Wild line. I took a chance on it because I really love the regular Wet n Wild gel liner and as it turns out the Fergie one is the same formula in... wait for it... better packaging! haha it comes in a little glass jar with a tight lid. Ahh that's wonderful news! I'll have to pick that one up once my Bobbi Brown one runs out! two natural sunscreens that's converted my family and friends are the live live sunscreen with msm and and devita's solar protective moisturizer. they're both spf 30. both great for sensitive, acne prone skin. i prefer the live live. it feels a little lighter and the ingredients are a little bit more helpful towards keeping the skin clear (msm, tea tree oil, calendula) and it has both titanium dioxide as well as zinc. the devita relies solely on a high percentage of zinc for it's spf and i tend to be a little bit more sensitive to products if they're too high in zinc. I've used up Mario Badescu's drying lotion a few times now, one of my favourite life-saving products! I love Rodan + Fields Soothe Regimen, I can never go without my #2 Sensitive Skin Treatment & #3 Moisture Replenishing Cream. This is the most amazing stuff I've ever used. It works great for my sensitive skin. You can see a huge difference in your skin after one use. I love to put on extra #2 to get rid of any red areas. I dab a little #2 in the red area and it disappears in a couple of minutes. Love it! 1. My favorite sun screen is DHC's. But it's perfect for oily skin. My skin is really oily. 2. I've used Sunrider's lotion and toner for decades. its ingredients are really good, and its really really mild and perfect for sensitive skin. Cuz my skin is very sensitive, it affects right away when i use bad cosmetic, but when i first used Sunrider's products, my skin didn't affect any negative way. My mom strongly recommends Sunrider's sun screen as well, but it's only good for dry skin, not oily skin. 3.Acure seriously facial serum: I use it only in the evening, after i wash my face, leave a little water on my face and cover my face with 2~3 pumps of this product. Then the next morning, i can find my skin gets much better. this product is really helpful for skin reproduction. What's the brand of what you are wearing? it's really good on you!! I've been looking for that kind of fur sweater. And your today's make up is awesome. could you make a tutorial for exactly same with today's makeup? Hi Jenn, love you! I was wondering, a while back you were trying this at home hair removal device. Are you still using it? Any thoughts on it? I was waiting for a review, but never came. Just wondering, thanks! Me too! I'd love to hear about your experience with your hair removal device too! I love SkinAqua Moisture Milk sunscreen! (http://www.amazon.com/SKIN-AQUA-Sunscreen-Lotion-Moisture/dp/B004LPZZU0) It seriously goes on like water, no thick/greasy stickiness. I found it at in a grocery store when I was in Japan for about $12, and now that I'm back in the states, I'm so glad I can get it online! It's more expensive, but to me, worth the price. Its active ingredient is the physical sunscreen zinc oxide which provides better UVA protection than most chemical sunscreens. On the downside, it's not as waterproof as most chemical sunscreens so I wouldn't use it for any sporty activity, or on days where you expect to sweat buckets. For an everyday sunscreen though, it's awesome! What percentage zinc is it? Hey Jen, do you have any recommendations for a long wearing blush? I almost never wear a base (foundation/bb cream/ primer) but want a little bit of color on my cheeks that will last. I was thinking about the tarte amazonian clay blushers but I'm not set on anything. I almost emptied out a different one: the Elta MD UV Physical spf 41. Doesn't break me out, uses all mineral sunscreen and it's tinted so your face isn't all washed out. I'm not super oily though and it creases up a bit on my eyelids if I forget to powder down so I don't think I'd recommend this particular one for oily skin. Best mineral sunscreen I've tried ever. My next to-try is the Skinceuticals Physical Fusion UV Defense spf 50. Pricier than my Elta MD, but a lot of people love to prime with it too before foundation so I want to try this for that. This one is actually a Martha Stewart favorite--I totally got a kick out of the idea that she and I reach for the same thing! I've used up bottle after bottle of the Mario Badescu Drying Lotion! It's so fabulous and it really works. I was just wondering, are you going to do a Naughty and Nice list for 2013? Hi! I am from Brazil and, after I saw your empties video, I went to a Clinique store and bought not only the mosturizer, but the 3 steps kit, too. I really liked the moisturizer, as it didn't leave my t-zone oily as the la roche posay one.